Another day, another hairstyle that black women have rocked for ages being credited to a white celebrity. 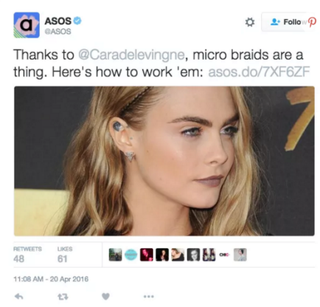 On top of Kim Kardashian making "boxer braids" a "thing," we can now thank model-actress Cara Delevingne for making microbraids a "thing," according to U.K. retailer Asos. Never mind that microbraids have always been a thing for black women; of course, this is just another example of things becoming trendy once white celebrities decide to wear them. And for the record, before you get yourself in a tizzy and decide to set your keyboard on fire with comments, no one is saying white women can't wear them. Stay tuned for the next installment of "We Did It First but Won't Get Any Credit."